I posted this photo when I was moving into my studio last October. It was quite the challenge getting my stuff up these stairs, especially in the 100 degree plus heat. 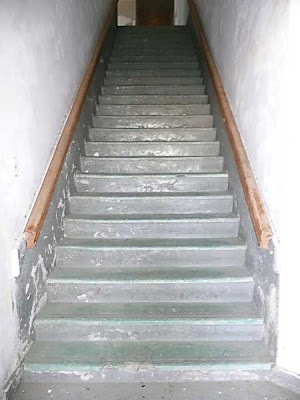 By the way, the stairs are a lot steeper and narrower than they look in this photo. Since then, I've been faithfully hauling myself up and down on a daily basis, sometimes multiple times a day. Once up, I'm in my beautiful studio, and quickly immersed in my work. It's been worth the climb. One of the prices I've paid for being an artist is a lot of foot pain. I know, not exactly a romantic image to present to the public. What many people don't realize is that making art often involves hard physical labor. Somehow, I always end up working, standing on a concrete floor. Yesterday, I finally broke down and saw one of the excellent doctors at the clinic here in Ajo. He told me that I have a torn ACL in my foot. Hence, the more recent, more excruciating pain in the feet than usual. The cure? Stay off my feet. Most expecially, don't climb stairs. Apply heat to the area. How long will this last? Well, a lot longer if I'm not careful. So those stairs loom ahead, and my work sits, potentially out of reach. Will I lay down with my feet up? Well, no. I'm heading to my studio now. Wish me luck!